If you’re a cyclist, junctions are the parts of the road network where you’re most at risk. Whether it is lorries turning left across your path, or an intimidating volume of motor traffic piling up behind you, major intersections are not nice places to be, even if you have plenty of experience. Part of the problem is that when a driver sees an open road ahead then gets a green light, the last thing they want to do is wait behind a slow moving two-wheeler. If green means ‘go’, the cyclist is merely an impediment. And woe betide the pedestrian who doesn’t cross in time. Contrast this with those rare occurrences when, for some reason, the traffic lights aren’t working. No green light saying ‘go’, no red light saying ‘stop’. When the lights are out, everyone at the junction turns into a person. People look at each other, try to predict what will happen next, assess whether they can proceed and, if they can, they pass through with caution, very slowly. In the absence of a traffic control system, people don’t get impatient; they don’t have the opportunity: they’re busy with what’s in front of them. When there’s no priority, there’s no frustration. And the traffic flows smoothly. Pedestrians can cross easily too. If taking away the lights makes a difference, the difference is greater the more complex the junction. It is very noticeable when a six-phase traffic light system goes out, for instance. This was the story a couple of years ago at Fountain Place, a major junction in the centre of Poynton, Cheshire. When the lights went out here, not only did traffic keep flowing through the junction, it flowed better, as shown by shorter-than-normal approach road queues. Road users might have assumed there had been a blown fuse or a power cut that morning, but in fact the lights had been switched off deliberately, and driver behaviour was being observed. Drivers were cautious and courteous. They took turns. They let people cross. Without green lights to authorise aggression, drivers became people again. 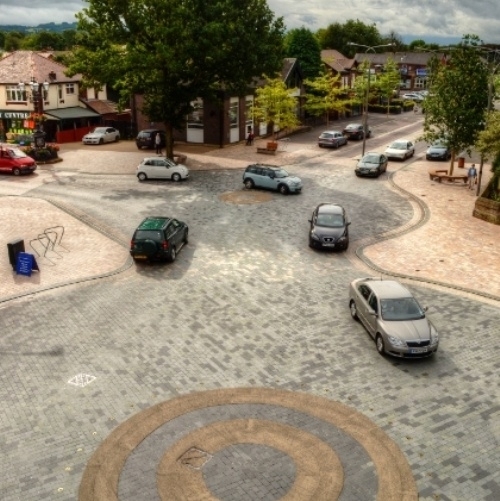 The people of Poynton were soon to benefit from a junction redesign both audacious and simple. Having established that people were capable of sharing the space, contractors began re-engineering Fountain Place, removing signals and signage, reducing the number of approach lanes from four to two. 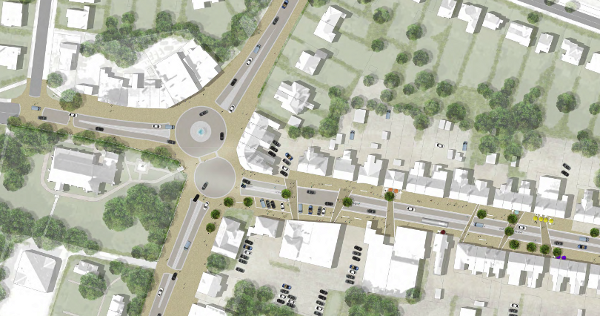 Part of the redesign plan for Fountain Place, showing the four approach roads and the double roundel at the intersection. Image: Hamilton-Baillie Associates. The effect is profound. The single lane approaches make drivers feel like they’re entering a ‘gateway’ into the town centre, while the non-asphalt surfaces signify that the space they’re entering is not just for cars, it is to be shared with pedestrians. So drivers slow down; not because there is a speed limit sign telling them to, but because they decide to: it feels like the right thing to do. Yet throughput at Fountain Place has increased, just as it did the day the lights went out. “What Poynton has demonstrated is that it is possible to create this continuous flow, low speed environment, still cope with pedestrian crossing movements and, most importantly, re-create a space, a place, outside the church, in the centre of Fountain Place, which is part of the town and is no longer merely an appendage to the highway,” adds Ben. There have been no injury collisions since the redesign. It seems people really do drive ‘with due care and attention’ when the circumstances require them to. Wow, the cyclists are back! The space is now more cycle-friendly too. Though no surveys have been done into cyclist numbers at the Place, ad hoc observation seems to show that cycling levels have increased. Before the redesign “it was very difficult to pick up any data on cyclists at all, they were very rare indeed,” says Ben, adding that this was “partly because the London Road, the main North to South route, is so unpleasant to cycle on”. Would Ben attribute the rise in cycling to his redesign? “There would appear to be a strong correlation between places which are attractive in their own right and the quantity of cyclists,” he says, adding that “the increase in footfall in the street is very evident.” Turnover is reported to have increased “in about 80% of the shops” in the area, and 15 of the 16 vacant commercial properties have been filled, he tells me. Fountain Place is now a ‘place to be’. Fountain Place after redesign. The image at the top of this article shows the same square, as photographed two years earlier. Photo: Hamilton-Baillie Associates. Town centres should be hubs of activity. They should be special places, and their design should give us that sense. They should be places to be, rather than simply spaces to travel through. This effect was achieved in Poynton at relatively low cost and the people like it. Pedestrians and cyclists like it, because it puts them on a level with drivers. Drivers like it because they don’t waste time sitting at red lights, getting frustrated. Let’s remember it takes audacity to take a large junction, to say ‘it’s broken’ and to go back to the drawing board. That audacity was precisely what was needed with Fountain Place; road-planning-as-usual wasn’t working; the design tenets of the 20th century had failed. The results seem too good to be true: they increase throughput by reducing capacity. How did they do it? They started by removing the signals. In doing so, they devolved traffic control to the lowest level – the level of the individual road user – and they trusted those users to be civil towards everyone else. Mindless obedience to traffic signals was replaced with the rules of human interaction – and under those rules, there is no entitlement to unimpeded progress, and no licence to be aggressive towards non-motorised road users. >> The designer’s webpage about Fountain Place can be found here. >> A short documentary on Fountain Place was uploaded to YouTube in January by Martin Cassini. All images in this article are copyright Hamilton-Baillie Associates and are reproduced here with permission; the words are copyright Alex Bailey and GMCC.